For other uses, see Katherine (disambiguation). Look up Katherine or Catherine in Wiktionary, the free dictionary. The name originated from the Greek Αἰκατερίνα or Αἰκατερίνη (Aikaterina, Aikaterinē), which is of uncertain etymology. 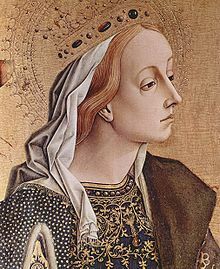 The earliest known use of the Greek name is in reference to Saint Catherine of Alexandria. The theory that the name comes from Hecate, the name of the Greek goddess of magic, is regarded by the editors of the Oxford Dictionary of First Names as unconvincing. In the early Christian era it came to be associated with the Greek adjective καθαρός (katharos), meaning "pure", leading to the alternative spellings Katharine and Katherine. The former spelling, with a middle a, was more common in the past and is currently more popular in the United States than in Britain. Katherine, with a middle e, was first recorded in England in 1196 after being brought back from the Crusades. In Britain and the U.S., Catherine and its variants have been among the 100 most popular names since 1880. The most common variants are Katherine, Kathryn, and Katharine. The spelling Catherine is common in both English and French. Less-common variants in English include Katheryn, Katharyn, Kathryne, Katherin, Kathrine, Catharine and Cathryn. Kathleen or Cathleen, an Anglicized form of the Irish form Caitlín, has become established in the US among people with no Irish background, but is less popular in England and Wales. The form Karen, of Danish origin, is now often considered an independent name in English. Diminutives include Katie, Katy, Kate, Kathy, Kathe, Kath, Kay, Kat, Katya, Katyusha, Kitty, Kit, Kasia and others. ^ Patrick Hanks and Kate Hardcastle, eds., Oxford Dictionary of First Names, 2nd ed. (Oxford: Oxford University Press, 2006), 154. ^ a b c d e f g h i j k l m n o p q r s t u v w x y z aa ab ac ad Withycombe, E. G. (1976). The Concise Dictionary of English Christian Names (3rd ed.). London: Omega Books. ISBN 1-85007-059-8. ^ United States Social Security Administration. "Popular Baby Names". Retrieved 3 November 2012. , for 2011 the order is Katherine (61), Catherine (161), Kathryn (237), Kathleen (632). ^ UK government Office for National Statistics. "Baby Names in England and Wales, 2011". Retrieved 3 November 2012. ^ UK government Office for National Statistics. "Baby Names, England and Wales, 1904-1994". Retrieved 3 November 2012. ^ a b c d e f g h De Felice, Emidio (1995) . Dizionario dei nomi italiani (in Italian) (3 ed.). Milan: Mondadori.